"Finland has a clear Nordic identity, but offers the best of both East and West. Its unspoilt natural environment is the perfect setting for all kinds of activity, whether you are seeking excitement or relaxation. Finland has a vibrant cultural life, with a busy calendar of festivals and events to suit every taste. 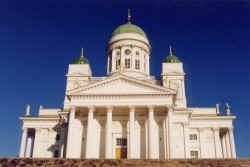 Also, Finnish congress, conference and incentive travel services are acclaimed throughout the world." (Just in case you want a congress, many countries are there to help). "In the capital of Finland, Finnish tradition and a long history of eastern and western influences weave a rich and enchanting tapestry. The city is full of contrasts, from the buzz of the business city to the tranquillity of its suburbs." "Fresh, unpolluted air, the presence of the sea and the green relief provided by the numerous parks, the excellent sports facilities, and genuine wilderness - easily accessible using the efficient and affordable public transport - make Helsinki unique among world capitals." A Finnish man jumped into the back of a police car by mistake as he left the scene of a robbery. The 28-year-old, only recently released from prison, jumped out again but was caught by security guards at a nearby shop. "He drove for four days breaking into petrol stations and cafes. He couldn't believe he'd jumped into an officer's car," said Chief Inspector Harri Pyosti. 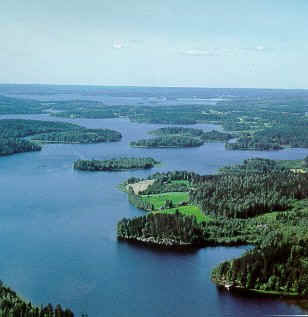 Police had been following the trail that began in the man's home town of Savonlinna, 205 miles northeast of Helsinki. It ended some 60 miles away in Leppavirta, when the thief, who wasn't identified, jumped into the police car. "It was real fate. The officer was off-duty at the time and didn't know the thief was about," Pyosti added. A Finnish man has shot his brother dead, mistaking him for an elk. The 21-year-old victim was hunting in the forests of Suomussalmi when the accident happened. The light was poor and the man's brother mistook him for an animal. He died before an ambulance arrived. 1100s Swedish crusades subjugate Finns and convert them to Christianity. 1323 Territory of present-day Finland becomes part of the Swedish realm 1550 Helsinki founded by the Swedes. 1743 By the Treaty of Abo, Sweden cedes southeast Finland to Russia. 1809 Finland ceded to Russia by Swedes. 1899 onwards Russian Tsar Nicholas II inaugurates policy of Russification of Finland. 1917 The Russian Revolution allows Finland to declare its independence. 1918 A bitter and violent civil war ensues between Bolsheviks (Red Guards) and the right-wing government (White Guards). 1919 Finland becomes a republic. 1939 WW2. Finland declares its neutrality. Soviet Union invades. 1940 Despite fierce resistance, the Finns are forced to concede. 1941 Germany attacks USSR in June. Finland launches military campaign to retake territory lost under Treaty of Moscow. Britain declares war on Finland. 1944 The Red Army invades. 1947 Peace treaty signed between Finland and Soviet Union. 1952 Payment of reparations completed. 1955 Finland joins United Nations. 1989 Soviet Union recognises Finnish neutrality. 1995 Finland becomes member of the European Union. 2002 Euro replaces the Finnish mark. A Finnish employer is offering £115 cash bonuses to workers who can do more chin-ups than he can. Crane company boss Pekka Niska from Helsinki said the health push may cost him money but will be worth it to have fit and healthy staff. Mr Niska, who at 66 still has bulging biceps and a washboard stomach, said: "I want fit employees. Even if it costs me hundreds of thousands of pounds it will be worth it in the end because their output will increase four-fold." Workers who want to go jogging during the day can also take up to an hour on full pay beside their lunch hour, and Niska will pay 70p for every kilometre they run after work. Employee Anette Hollander said: "I have so much more energy after a 10 kilometre jog that I get much more done at work than I normally would." A Finnish burglar got stuck as he attempted to get into a grocery store through a ventilation shaft. The 20-year-old was forced to cry for help in the early hours. Local residents in Joensuu heard his shouts and contacted the police. Firefighters had to be called in to rescue the man from the shaft. It is reported that the suspect was breath tested by police and found to be four times over the legal driving limit.